Where is the Capital of Hawaii? 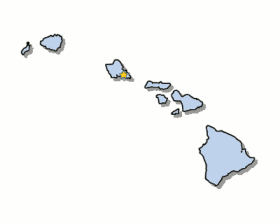 The Map of Hawaii (HI) shows the location of the state capital in the "Aloha State". The Hawaiian Islands has 5 counties, and the capital of the State is Honolulu. On a map, the capital city is always indicated by a star. Interesting fun facts about Honolulu, Hawaii including its history, location, county, current population, size of the city and the nickname of Honolulu, Hawaii. 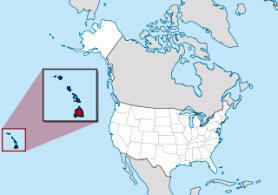 The Hawaiian Islands and map provides an outline of the state, which covers 10,932 square miles. The size of the state's capital city, Honolulu, is 68.42 square miles. Test your recognition skills of the map of the state, and knowledge of its capital, with our State Maps Quiz Game. The location of Honolulu is in the south eastern shoreline of the island of Oahu. The city is located in Honolulu county, Hawaii. Each of the 50 states have their own capital city. The city of Honolulu is the capital of the state of Hawaii. The capital does not have to be the largest city in the state, but is usually centrally located either geographically or by population. The State of Hawaii is the only state that is made up of Islands. Islands are located in Central Pacific Ocean in an archipelago to the west side of the United States. Fact 3: 1959 was the year of statehood, the Number of Counties in the Islands is 5 and It is the county seat of Honolulu county. Fact 4: The name 'Honolulu' means protected bay. Its Nickname is the "The Big Pineapple"
Fact 5: History - The British explorer Captain James Cook (1728–79) was sighted the island of Oahu, on January 18, 1778. Fact 6: History - King Kamehameha the Great (c. 1758–1819; r. 1792–1819), united the Hawaiian islands under one kingdom. Fact 7: History - The Territory of Hawaii, especially Honolulu, became a key military post to the USA during WW2 (1939–45). The number of people, or the population of the capital city of Honolulu, Hawaii obviously changes constantly but the government statistics for the 2009 population of Honolulu was 374,658, which provides a good indication of the number of inhabitants of the city. We hope that the interesting facts and information about Honolulu will help kids and school children with their homework. Learn more by playing the States and Capitals Game. Honolulu Nickname is the "The Big Pineapple"